The condenser aperture diaphragm (or iris diaphragm) is used to control the contrast and resolution of an image. This article explains the usage of the diaphragm. 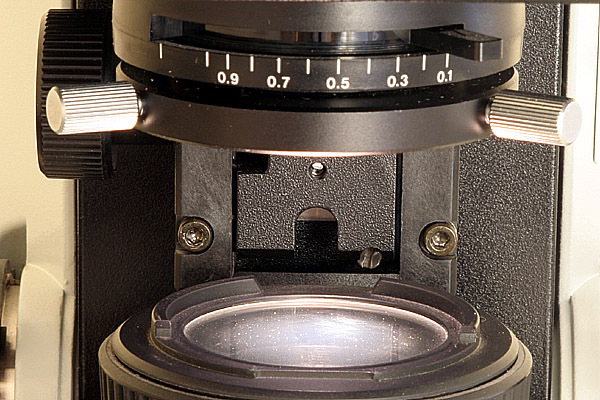 An improper setting of the condenser aperture diaphragm (especially at higher magnifications) can be the cause of much frustration both for teachers and students. Students may attempt to find the focus with the condenser aperture diaphragm all the way open. This is difficult if the sample is very thin or weakly stained or the microscope is not equipped with parfocal objectives. Remember, an open condenser aperture diaphragm results in a low depth of field. Students may not see anything at all when working with high magnifications because the image is too dark. In this case the diaphragm is closed too much. The diaphragm should not be used to control the amount of light, but for some specimens or magnifications there may simply be no way around this especially if the lamp is not very powerful. Many beginners are place an overly strong emphasis on magnification. Many think that they are able to see more at a higher magnification. But especially at higher magnifications the role of the condenser diaphragm becomes more important. 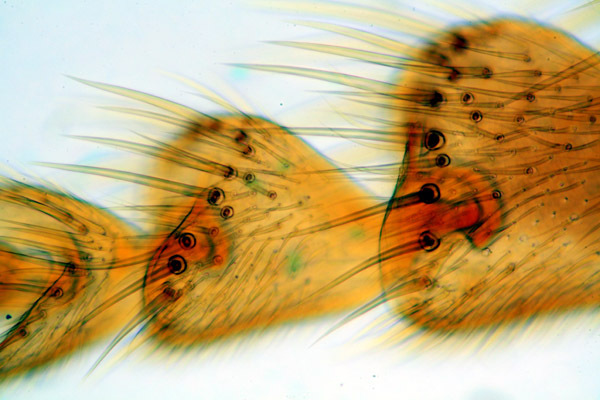 Instruct the students to completely close the condenser aperture diaphragm when starting to use the microscope. They should then rotate the low power objective (4x) into position and find the focus with the coarse focus knob. The larger depth of field and higher contrast makes it easier for the students to focus the specimen. When switching to a higher magnification, the students should start to gradually open the condenser aperture diaphragm, to observe the differences in image quality. At the same time they have to adjust the light intensity with the dimmer to prevent glare. Students should be made aware that the condenser aperture diaphragm should be adjusted to the numerical aperture value which is printed on the objective. Opening the diaphragm further will not increase image quality, but may result in glare. If the sample is thick, strongly stained or pigmented then the diaphragm has to be opened to allow more light to pass through the specimen. As a consequence, the depth of field becomes smaller. It is then necessary to use the fine focus adjustment knob to focus through the different layers of the specimen. The condenser aperture diaphragm can be controlled with a small horizontal lever (top). Left and right are the condenser centering screws. They are needed for adjusting Koehler illumination. Behind the left centering screw you can see the condenser focus knob. Here the condenser aperture diaphragm is set to a value of 0.25, which is the recommended value for the objective in use. The depth of field is low, the resolution high, the contrast is low. Here the condenser aperture diaphragm is set to a value of 0.1, which is the closed position. The depth of field and contrast are both high. The image appears crisp, but resolution is lower.